New data from eMarketer shows how important digital video has become in the lives of our children. For those using a connected TV and portable device to stream, digital dominates their viewing behavior and their brand mind-share. 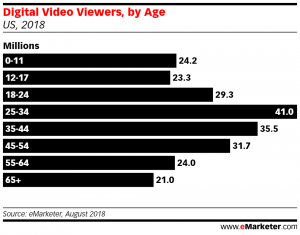 According to eMarketer, digital video reached 24.2 million children under 12 years of age in Q3 2018. However, more children still watch traditional television. Nielsen says that in q1 2018, traditional television reached 35 million children between 2 and 11 years old. The trajectories of usage are vastly different. The two-thirds of under-12s that watch video through a connected TV device have increased their TV streaming time viewing time 81% between q1 2015 and Q1 2018. They now watch 6 hours per week. Almost half of the under-12s use a tablet or smartphone to watch video, and they spend more time than TV streamers doing so. Nielsen says they watched 8 hours and 12 minutes per week through their device. 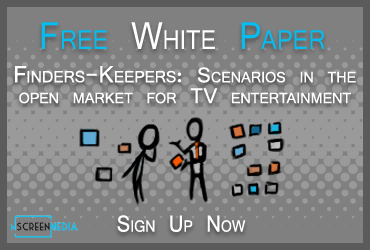 Those that watch traditional TV are watching 30% less traditional TV and 36% live TV than in Q1 2015. The average TV viewer under-12 watches 21 hours and 48 minutes of live and time-shifted TV per week and 18 hours and 24 minutes of live TV. With all the digital video they are consuming, the under-12s now recognize digital brands before traditional. Children between 6 and 12 years old ranked YouTube and Netflix as the number 1 and two most favorite brands, ahead of toys, candy, and video game brands. eMarketer says that more teenagers watch digital video than traditional TV in the US. Today, there are 22.5 million US teenage traditional TV viewers and 23.3 million digital video viewers. Next year, the company is forecasting the difference will grow even sharper with 23.4 million teenage digital viewers and 22.3 million traditional TV viewers. The time teens spend with digital and traditional TV is heading in opposite directions. Nielsen says that U.S. teen traditional TV viewers watched 11 and a half hours of live plus time-shifted TV in Q1 2018, a decline of 30% from the same quarter in 2016. Live viewing was down even more. They watch just 8 hours and 36 minutes per week, a decline of 38% over the same period. The 61% of teenagers that stream video to a TV are watching dramatically more. Between Q1 2016 and Q1 2018, viewing increased 136%, to 4 hours and 42 minutes per week. The 2-in-5 that watch through a tablet or smartphone stream 6 hours and 36 minutes per week on their device. For those teens with access to a smartphone and connected television, most of their viewing is now from digital sources, not traditional TV. Both teens and under-12s are watching 30-40%% less traditional TV than two years ago. Digital video viewed through connected TVs and devices has more than replaced the lost linear and time-shifted television viewing. Under-12s now rate YouTube and Netflix brands higher than any other brand with which they are familiar.